‘State of the Union’ drops 3/3 on CD! On the eve of our 20th anniversary as a performing band (!!! 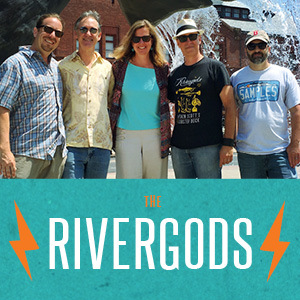 ), The Rivergods are set to release a new full-length album, State of the Union, on Friday, March 3, 2017 at All Soul’s Hall in New London, CT.
State of the Union features over 52 minutes of new Rivergods’ music… 12 new original songs, recorded and produced by Carl Franklin at Pwop Studios in New London, CT in October of 2016. The album is loosely thematic and showcases some pretty smoking musical performances by our current line-up (if we do say so ourselves!!) It’s our first full-length album in several years, and we’re super excited to share it with you. Stylistically, the music on State of the Union runs the runs the gamut of the Rivergods’ harmony-rich roots/Americana/folk rock sound, from the fuzz guitar-driven rock of the album’s opening cut “Jubilee” and closer “State of the Union”, to the country swing of songs like “Churches” and “New Traditional,” to the folk pop of “New Emperors” and “Dress Like a Poet” and finally, the torch song balladry of “Station Down the Line,” co-written with our good friend Steve Elci, which features a standout solo vocal performance from Rivergods’ co-vocalist Nancy Parent. The band will be playing two long sets to celebrate the CD release of State of the Union, including performing the full album live from start to finish. We’ll have copies of State of the Union available for purchase, along with cool new men’s and women’s Rivergods t-shirts… yeah!!! We hope to see you there! Spread the word… and thanks for your continued support over the years! Rivergods at the Rock Haus!